Today we’ve got a Q-and-A with Keith and Laura James, founders of Amish Workshops. I’ve been looking forward to this interview for a couple of reasons. The first reason is that I think it’s quite an interesting look at how an Amish-oriented business gets started and operates. Amish family businesses benefit from and rely on relationships with non-Amish people. As Keith and Laura’s story shows, it can be rewarding on many levels. The second reason? Well of course–I hope people will buy tons of stuff from Keith and Laura! Running this site for 5 years, I’ve gotten offers for advertising before, but have tried to be selective. For one, I don’t want to overdo it on the ads. That said, the ads do help with running and developing the site. If not for the little extra income, I would need to put more hours into my day job, and less would get done around here. So I’m grateful for it. When I heard from Keith about advertising, I immediately thought it could be a good match. One reason was the positive impression I’d had on visiting the Amish Workshops site. You can tell they care about their business, and put a lot into it. In addition to the great line of products and lovely design, they’ve also got quite a few interesting articles, as well as columns written by their Amish friends (you may remember the Amish farrier article, or piece on Amish hair-pinning). It’s worth a visit just for those–not to mention the splendid photos (you’ll read a bit more about how they accomplish some of their shots below). Keith and I haven’t had a chance to meet in person yet (we missed each other by about a week this summer), but I did visit with one of his long-time Amish friends in Michigan this summer, a sawmill owner, who happens to fit into the Amish Workshops story, going way back. So if you’ve got Christmas shopping on your mind, I’d encourage you to consider checking out the nice things at Amish Workshops. And even if you don’t, visiting the site is well worth it for the interesting stories and behind-the-scenes looks at Amish life you’ll find there. Amish America: Tell us a little about your business? What do you do? Keith and Laura James: We sell fine crafts made by Amish folks. Most of our suppliers are in Indiana, but we also have several in Michigan and Pennsylvania. We sell everything from quilts to rugs, perpetual calendars to bird feeders, wind chimes to hand-woven baskets. Currently we have just over 700 products available from more than 60 crafters. Keith and Laura: We operate a web design company and have been making websites for other companies over the past 17 years. For some time we discussed creating our own e-commerce website but struggled with what we would want to sell. We wanted to sell something that was “good”, meaning something that was made well, was original, and most importantly, something we could genuinely feel good about selling. In the summer of 2010, after a visit from Viola and her cousin, we discussed the idea of selling Amish crafts, which totally fit with our idea of “good” products. We called Viola, who is Amish, and asked if she would be interested in working for us as a liaison to the Amish community. After much thought she agreed, and we got started. Our first buying trip was in December of last year, and then we spent several months compiling a product catalog and building the website, which was launched last April. When did you first meet Amish? How often do you visit Amish communities? Keith and Laura: Keith first met the Amish on a trip to southern Michigan in 1985 when he was 22 years old. A friendly bishop invited him into his home to meet his family. In 1990, not long after they were married, Laura joined Keith on another trip and she quickly came to understand why he was so enamored with the family and their simple, friendly ways. We’ve been regular pen pals with several families over the years and our kids have grown up reading about their interesting, industrious lives. Most of our family vacations have been back to the Michiana area. Most times we rent a small cottage on a lake and visit our Amish friends often, although we have stayed at their farms. Our daughter, who is now 14, has especially enjoyed the trips. She has several girlfriends her own age who dress her up in their Amish dresses and prayer kapps. She loves helping with the chores and playing with the horses. It’s a very different life from what she knows in the suburbs. 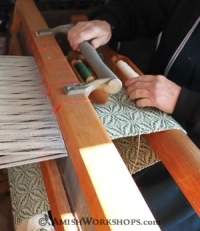 Can you share a bit about some of the craftsmen behind your products? Keith and Laura: Although some of our suppliers have large workshops, most are simply individuals with a passion to create something beautiful, functional or both. One of the best parts of this business is having the opportunity to visit them in their homes and workshops and get to know their families. Owen, the man who creates our wooden farm toys, has a large workshop on his farm where he and his sons work together to create everything from miniature buckets and bales of hay to large barns and full corrals. The first time we met Christine, a mother of eight children who makes beautiful embroidered quilts for us, we learned that she had lost her husband just a few months before. 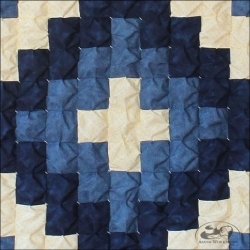 At the time she didn’t have any quilts ready for sale, but was exploring options for producing income for her large family. When we visited her again last August to photograph some of her offerings, the mood in her home was much lighter; it seemed as though much of the grief was lifted. Loren and Dorcas are a very nice young couple who work together to make an excellent line of leather goods. Next to their country home is a small workshop where they cut the leather from full hides, often with their two young daughters running around the shop. They even use a manual sewing machine with a treadle! Loren makes some of the nicest leather belts we’ve ever seen, and the leather purses Dorcas creates rival what you would find at Nordstrom. Can you share a bit about some of your favorite items? Keith and Laura: That’s tough to answer because we have so many favorites! If we had to name just a few, Rosemary’s perpetual calendars would certainly be near the top of the list. 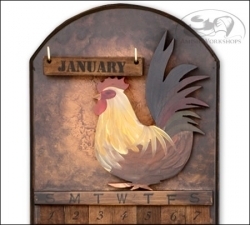 Her husband is a woodworker who actually builds the calendars, and then Rosemary paints and decorates them beautifully in an array of designs. A white-haired gentleman named Samuel makes our wonderful 18” doll furniture, perfect for American Girl dolls. He uses 100% genuine oak, not pressboard, and his suite of furniture includes a chest of drawers, a wardrobe, vanity, bed, hope chest, and night stands. We have two lines of baskets, very different but both are great. Dorothy makes hand-woven baskets from reeds in all shapes and sizes, and Clayton makes collapsible wooden baskets from beautiful American hardwoods. And finally, this list would be incomplete without mentioning Orly’s wind chimes. These are not your typical fishing-line-and-tin-tube wind chimes, but high-quality chimes made with the finest materials. If you visit the website you can even listen to the sounds the chimes make. 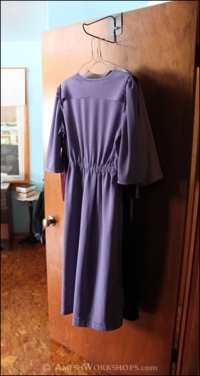 What are some of the challenges of running a business selling Amish products? 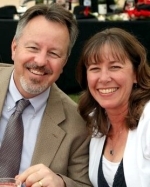 Keith and Laura: Things move a little slower because the Amish choose to lead simpler lives. For example, most Amish have telephones these days, but they keep them out of their homes in phone shacks, workshops, or barns. When we get orders, we call and leave a message, and then wait for them to call us back. Usually we can get the orders shipped within a week, but we must balance not rushing our supplier but also getting our orders to customers within a time they expect. We do most of our own product photography, and one of the challenges has been the low light in homes with no electricity. When we visited Perry last year, a metal worker who makes our welcome signs, napkin holders, and mailbox toppers, we arrived late in the afternoon on a very cold winter day. The sun was on its way down and we were losing light quickly as we worked to photograph the products in his pole barn. Without a tripod to steady the camera, Keith finally laid down on his belly on the cold concrete, using his elbows to steady the camera. It was about 15 degrees in the barn as Keith snapped photos by the light of a window while Laura and Viola measured and weighed each product. Keith heard snickering from behind him at one point and looked over his shoulder to find that Perry’s large family had arrived home and were quite amused at the “Englishman” lying on the floor. We also wanted to provide more than just a store to our visitors. Understanding that people are interested in Amish crafts because of who creates them, we developed a website that also provides lots of information including recipes, stories, photographs and one of our most popular features, Ask Viola, where people can ask questions about the Amish culture and get answers from a real Amish person. Keith and Laura: Simple! 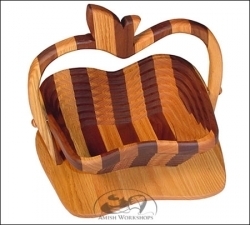 Visit www.AmishWorkshops.com to see all our products along with articles and recipes. We’re adding more all the time! I’ve visited Keith and Laura’s site many times, and it’s so interesting to read this lively interview with them! Heading over there to do some Christmas shopping! Great post – and I really enjoy hearing the stories behind the items. Can’t wait to do a little online shopping! Perfect timing for this article, I’d say. Thanks!! I am pleased to see someone working with the Amish communities to market what they can produce. I am mor einterested, myself, in things that Amish families use themselves rather than the products they market to the outside community. We are Plain-living but isolated from a large Plain community. 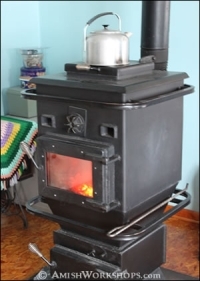 We have talked fromtime to time about marketing things like Amish-made wood stoves (no coal here) and off-grid living products. So far,w e have no capital for it, but there is a market for that as well. Lehman’s fills that market in the US, but there is no local or Canadian equivalent. I love the collapsible baskets. I just can’t decide which design to get! I spent quite awhile the other day going over the website. They have a lot of interesting items. I look forward to going back to the site and going over things again – this time with my credit card! lol. Thanks for the interview. It was interesting! I went to your wind chimes site to find a specific sounding chime but there is no Audio Panel to click on to listen to the various chimes. Hi Ruth, I just passed this on to Keith, hope they will be able to help us out on that. Thanks for letting know. …and tell me if you can see the audio file player, under the sentence that says, “Click the right arrow to hear chimes:” Thanks! Erik, thank you so much for giving us the opportunity to tell your readers more about our business. We couldn’t ask for a better venue! And we appreciate all the nice follow-up comments – they sure do put wind in our sails! We would like to offer a holiday discount to your readers. Now through December 12th, enter coupon code AAHOLIDAY at checkout to receive a 15% discount on your order. And thanks again for visiting AmishWorkshops.com! Wow! Thanks a lot Keith! That is so nice of you! As always, I thank you for your wonderful posts. This is new to me and I’ll be checking out Amish Goods. Traveling to Randolph tomorrow! Will be eating a good “fry” pie in your honor! Thank you Ann! Hope you had a great trip to Randolph. You know fry pies will never go out of style. I wonder if Keith and Laura carry a fry-pie holster of some sort, so you could tote around 3 or 4 with you strapped around your waist at all times (just in case the fry pie munchies hit). Don’t get me started on fry pies – I love them! Our friend Paul (the one you met in Michigan) and his wife are big supporters of their children’s Amish school, and their most popular fundraisers involve making and selling fry pies. The parents and kids from the school team up to make more than 3,000 fry pies in flavors like peach, blueberry, lemon, and my favorite, black raspberry, which they sell to the greater community at large. Seems like I’m always visiting either right before or right after a fundraiser, but I sure would like to be there to help make them. I have discovered, however, that more than two at one setting is not a good idea. Too much is too much! Keith my visit to Paul’s was a blast, I can see why you have been friends for so long. I also got a great crash course in lumber while I was there! Really great post. Love the photos and appreciate the discount offer. I am heading over to the web site. I would also like to know if the Amish use most of the products in the store. There are some wonderful Amish folks on my Christmas shopping list. Thanks Erik, Keith and Laura! Hi Marjorie — The answer to your question regarding whether the Amish use the products on our site is yes and no, depending on the product. For example, Amish men don’t wear belts, preferring suspenders instead. The pet collars with rhinestones are a bit too fancy for their use as well. But most of the other products on the site would definitely be acceptable. Woven rugs, clothes dryers, farm toys (including trucks and tractors), quilts… anything practical but not too fancy. I think that’s the tipping point: if it’s considered too fancy it becomes a matter of pride or being prideful, which doesn’t set well with a community known for its plain and simple ways.